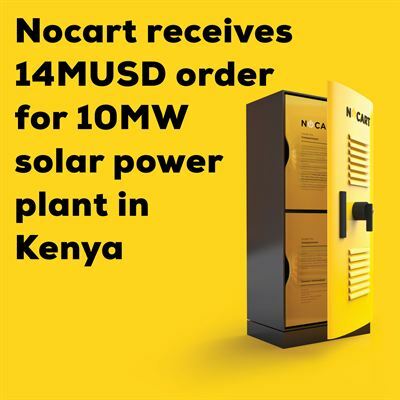 Nocart has signed a purchase agreement for the delivery of a 10MW grid-feed solar plant to an independent power producing company (IPP) in Kenya. The project is scheduled to start immediately and first deliveries by Nocart are estimated at 6 months after down payment. The value of the deal is 14MUSD to Nocart. Cleantech Invest (under name change to Loudspring) owns 19.3% of Nocart. “Rural electrification in Africa continues to grow and with Nocart on the ground in several African countries they are now playing a critical role in making sure that this electrification is decoupled from carbon emission growth. With the signing of this purchase agreement in Kenya, the Nocart team has shown that they can continue to move large projects off its massive project pipeline through to this critical stage of signing of a purchase agreement. We are excited to see Nocart taking a growing role in lighting up Africa”, says Alexander Lidgren, CEO of Cleantech Invest.